The Red Sox Yankees rivalry is over. This is an elementary, but quite helpful way to understand gentrification at its core: gentrification is a social vibration that transforms places into spaces. That is to say, gentrification takes a place – like an urban neighborhood once defined by the presence of a particular ethnicity, a unique urban culture and vibration, a collection of families and neighbors with shared communal and historical bonds – and makes it into a universal space: a completely abstract urban area defined by short term renters, a precarious real estate and labor market, young cognitive professionals – ¨Yuppies¨ – directly plugged into the day to day operation of globalized capitalism: with gentrification everything in the urban horizon essentially becomes the same space. Gentrification destroys, by default, the very idea of a concrete, local urban place in order to erect a globalized territory so it can continue reproducing itself from the unhibited flows of technology and capital that are allowed to move freely throughout this newly created space. A perfect example of this in Boston’s North End. Up until the 1980s, even into the 1990s, this was the archetypal Italian working class neighborhood, the Little Italy of Boston: it was, strictly speaking, the very definition of a place: kids on the stoop, old Italian grandmothers looking out the windows, a series of family owned businesses, etc. But now, in 2018, the North End functions more as a tourist destination, almost like the Italian section at Epcot Center for neoliberal tourists so they can be deluded that they are experiencing “authentic” Italian-American culture: the North End has been stripped of itself as a unique place and reconfigured as a weird consumer tourist space in the dimension of something that even Jean Baudrillard would scratch his head at. Another interesting way you can see the true and direct effect of this very same operation – the transformation of place into space – is in the clear and present crisis of meaning that can now be found in the contemporary Red Sox and Yankees rivalry versus that of the past. The basic function of gentrification is to cut off a person, or a neighborhood, or an entire city, from their own history, and their own sense of place. Gentrifications cuts the city away from its own history and then inserts it into the pure present, into a pure global space, under the vibration and code of digital “real time.” Gentrification does this – severs the urban individual from their sense of history and place – for the very simple reason that the person can be a more effective consumer without the weight of the past, so that the person can better directly participate in the dynamics of globalized capitalism and fully embody the ideology of neoliberalism in their day to day life. This function materializes in many different ways, but one of the most obvious ways is the collapse of “the Neighbor.” Just like the professional baseball teams of the present day that seem to have a completely new roster every year, it is just the same with the contemporary urban neighborhood that now seems to have a completely new set of residents each and every September: you simply cannot trust that your neighbor will be their tomorrow within the gentrified horizon, just like you cannot trust your favorite player will not be traded or sign a new contract the next day. So under the effect and vibration of gentrification, a system which as a rule subverts one’s relationship to both history and the integrity of a singular place so to generate higher levels of productivity and profit, you simply cannot have an authentic rivalry like the Red Sox-Yankees any longer: you cannot have it because the rivalry between these two professional sports teams was nothing but a reflection of the rivalry of place itself. What all this really points to is that you cannot have meaning any longer in the gentrified city. The sense of narratively structured meaning is progressively obliterated and a system of pure equivalence, exchange, and “data” is put in its place instead. Something like the Red Sox-Yankees rivalry was once so meaningful, so rich, and full of such a wonderful social energy because it was based on the narrative structure of history and the differential qualitative value of place. It was beautiful and intense and so deeply meaningful because the rivalry tapped into an energy between two cities that literally went back to the political differences between John Adams and Alexander Hamilton, the differential between the working class culture of Brooklyn and the Bronx juxtaposed against the working class culture of Roxbury and South Boston. But now, as these two cities have become progressively immersed in the same space of globalized capitalism and digitized technologies, mainly populated by the same exact class of people, the global Yuppies, a class that generally has the same worldview, the same values, and the same economic and cultural interests, the Red Sox-Yankees rivalry simply cannot be generated any longer as it once was: it is, Going, Going, Gone. Smith, H. The worlds religions. One cannot help but chuckle here that this off hand remark is one of Giles Deleuze’s most quoted and remembered lines. Deleuze, one of the great intellectuals of the 20th century, whose two volume Capitalism and Schizophrenia is perhaps the most significant philosophical text of the past fifty years, is often remembered more for this somewhat vulgar remark than he is for some of his most refined philosophical observations. But this straightforward statement nevertheless bears witness to a profound truth about human life — both in the personal and political dimensions. The obvious example of how this statement applies to the interpersonal domain is within the context of a narcissistic relationship. As a rule, one never realizes they are in a relationship with a narcissist until after the fact, until they have woken up and discovered that they are trapped in the narcissist’s twisted dream. And as it applies to the sociopolitical realm there are countless examples throughout history in which the followers of a certain politics — that of the third world dictators, the medieval kings, the corrupted emancipatory radicals, etc. — have suddenly woken up “in another’s dream” and then made to suffer the dire consequences. In this very Deleuzian spirit, contemporary urban gentrification is fundamentally a dream; it is the ideological dream par excellence of globalized capitalism as it applies to the 21st century urban horizon. And the basic function that this dream takes is that it can continue on forever: that the modus operandi of gentrification can somehow carry on indefinitely and obfuscate all of the countless social antagonisms it produces every single day within the City without them eventually exploding to the surface. What is now slowly (very slowly) starting to happen throughout cities in both America and throughout the world is that people are starting to wake up in the middle of this gentrified dream only to discover, in the words of Deleuze, that they are in fact fucked. But who exactly is fucked here? Are those who are fucked simply the remnants of the formerly working class and ethnic neighborhoods that once defined cities such as Boston — Irish South Boston, African-American Roxbury, Italian North End, etc. — that have somehow managed to remain in their neighborhood of origin amidst the onslaught of gentrification? Although the answer to this question is undoubtedly Yes, it is nevertheless an answer that is incomplete. Because the people who are truly fucked in this scenario are actually the cognitive professionals — “the yuppies” — the very people who have fully identified with the content of the gentrified dream and then lived it out in their concrete experience. What this means is that it is not just the “original” working class urban residents who are the only ones caught within the gentrified dream — the true dreamers are none other than the yuppies themselves. In other words, one of the basic fantasies that sustains the dream of gentrification in places such as Boston is that the “yuppies” (the young urban professionals, the hipsters, etc.) are actually happy, that they actually enjoy the experience of gentrification: that they enjoy paying exorbitant rent, that they enjoy the reduction of social and cultural life into a purely capitalist exchange, that they enjoy the instability of their professional networks, etc. When the “original” person from East Boston or Dorchester looks at the young professional who just moved in next door, they falsely assume that this person is “living the dream,” that they are thoroughly enjoying their urban experience without a care in the world. The truth of the matter is that the overwhelming percentage of “yuppies” are actually living in what could be more accurately called a collective nightmare: precarious jobs, unsustainable debt and housing costs, and perhaps most significantly — the ongoing deterioration of their mental health and collective social substance. One of the biggest mistakes that critics of gentrification always make is how they try to draw a formal line in the sand within the gentrification procedure. On one side is the middle and working class residents that once constituted the population of the pre-gentrified urban neighborhood. And on the other side are the gentrifiers: the young professionals, the yoga studios, the real estate developers, etc. But this is fundamentally a false divide, a distinction that blocks the deeper divide of what gentrification even is and where the actual line should be drawn. In a certain respect, to subscribe to the reality of such a false divide is actually what allows the gentrified dream to continue on indefinitely, what prevents people from actually waking up. Gentrification is first and foremost an ideological horizon that subjectives people. You could say the same thing in a more crude way: gentrification is an ideological horizon that turns people into “yuppies.” What I mean by that is that gentrification is a social process that reconstitutes human beings intro contingent instruments of a purely capitalist and technical exchange in all areas of urban life: family homes are turned into short term expensive rentals; romantic relationships are turned into swipes on Tinder; the human friendship once developed on the front stoop are turned into the amount of Likes and Shares we are able to accumulate on our thoroughly privatized social media accounts. What this means is that the true divide of gentrification is drawn right down the center of our very Selves: the true divide of gentrification is fundamentally within us, not “out there” in the City at large. I am by no means adopting a version of the typical New Age position, “You must first change yourself before you can change the City you live in.” What I am saying something far more disturbing in regards to contemporary American Cities and their urban residents: that they already have changed, but they didn’t realize it because they were caught in another’s dream when it happened. The recent attempt to put a Starbucks Coffee at the entrance of Hanover Street in Boston’s North End was in many ways akin to a loud snooze button, a jarring noise that suddenly wrestled up the sleeping North End community from its thirty year slumber, mobilizing the community into a collective action in which they achieved a concrete political victory: after the direct intervention by the mayor of Boston Starbucks Coffee will not be moving to Hanover Street after all. The danger now is that the North End will simply press the snooze button, sleep for another five years or another decade, before another Starbucks-like incident wakes them up from their collective slumber yet again, an event that will undoubtedly happen in due time. But things get interesting when we actually listen to the man speak, once we hear the care and logic in his voice that unapologetically justifies the decision to carry on with his life’s work in the face of such pervasive criticism and questioning. The problem with (this world) is that everything is incredible but no one can accept it. The problem with the North End is that it is incredible, but Starbucks can not accept it. When hearing a quote like this, our initial reaction, in a flood of emotion and memory, is to simply praise it as a statement of pure truth. But what is often is absent in such a moment is any real critical reflection. We are afraid that if we intellectualize such a statement we will potentially lose its raw spiritual power. So, what is truly needed here is not just a standard critical reflection, but rather a critical reflection that can still retain the emotional force and spiritual depth of the proposition itself. So although I absolutely agree with the underlying sentiment of the man’s statement — “The problem with this world is that everything is incredible but no one can accept it” — one cannot help but look around today at the state of working class urban neighborhoods throughout America, like the North End in Boston, and encounter the sad fact that things are anything but incredible. Things are actually not good at all if we are being completely honest with ourselves: real estate prices are spiraling out of control, local communities are progressively losing their history and culture, and real estate development funds and transnational corporations like Starbucks are now moving in and radically transforming the social-symbolic substance that these very neighborhoods once signified — forever changing them away from their working class, ethnic, and family oriented roots. In this very sense, the fight to keep a Starbucks out of the North End — or the ridiculous attempts to represent Boston’s ‘Little Italy’ as a living testament to working class and ethnic life in contemporary Boston when in reality the average condominium price is now approaching closer to one million dollars in the neighborhood — has a similar logic of trying to build a helicopter in your garage. And this is precisely why the people, politicians, and corporations that defend the gentrification process as being “natural,” as being “just the way things are now in the city,” often claim that anyone who tries to resist gentrification is simply silly, foolish, or borderline crazy — which is precisely why one should do it. In other words, fighting back against gentrification in contemporary American cities is exactly the same as trying to build a helicopter in your garage. In one sense it is stupid and ridiculous, but in a much deeper sense it may in fact be the only real way to discover that the world is actually incredible, to see that the world is actually beautiful: we can only find out who we really are when we try to do the impossible, when we are willing to risk it all for something that we believe in. A Starbucks trying to move into the North End and the incredible backlash it has produced over the past several weeks, culminating in a community hearing on June 28th in which virtually every major media news outlet in Boston covered as the lead story that same evening, has very little to do with this specific Starbucks itself. Such an impassioned response is more like a setting off point, the proverbial “straw that broke the camel’s back,” that rather speaks to the tail end of a three decade process in which a neighborhood like the North End has been continually drained of its people, history, and unique culture. But why now? That is to say, why are The people just resisting it only now, in 2018, in such a palpable and direct way? The principal reason why 21st century urban gentrification is ultimately so dangerous to cities around the country is because gentrification is first and foremost an abstract process, it is ideological, that only reveals itself through its own self-produced symptoms. And, what could be more of a symptom exploding to the social surface than a Starbucks Coffee trying to open a store at the very gateway of historic Hanover Street? What I mean by that is that even if you think you can “see” gentrification in action, the true danger of gentrification lies in the fact that it is an invisible phenomenon. It is invisible because gentrification is ultimately only a way of thinking, it is a way of orienting yourself and experiencing the urban world without the accompanying consciousness of its logic. The purpose of gentrification, like the purpose of a Starbucks, is to put everything and anything into a system that is fully mediated by a global capitalist logic, technological efficiency, and a spirit of pure competition. This is precisely why something like gentrification absolutely loves Linkedin profiles, Tinder Swipers, and corporate coffee chains: gentrification only works when people are ruthlessly competing with one another: it is truly the ultimate “dog eat dog” phenomena in 21st century urban American space. But what gentrification cannot stomach, what it cannot to stand to be around, what terrifies it more than anything are things like friendship, solidarity, and self-respect. Nothing is more frightening to gentrification than two people sitting on a front stoop watching the world go by; nothing is more unsettling to its logic than an urban community with nothing left to lose that is finally willing to fight back. A Starbucks trying to move into the historic gateway of the North End in Boston — even if this neighborhood is not even historic any longer, even if this neighborhood is already a thoroughly gentrified neighborhood in its present state — is in many ways symbolic of everything wrong with the world today, and most certainly everything wrong in America; which is, in a sentence: corporate violence against local communities and local people. Seeing the small, remaining North End community mount a pushback against a multinational corporate giant is actually a beautiful thing to witness, it is something that can give us all hope and faith in the world, just like a person in a wheelchair determined to build a helicopter in his garage. The North End is incredible. It is, as Jane Jacobs once correctly remarked, one of the truly great urban neighborhoods in America. And it is absolutely worth fighting for, most especially because of the fact that it is already gone. 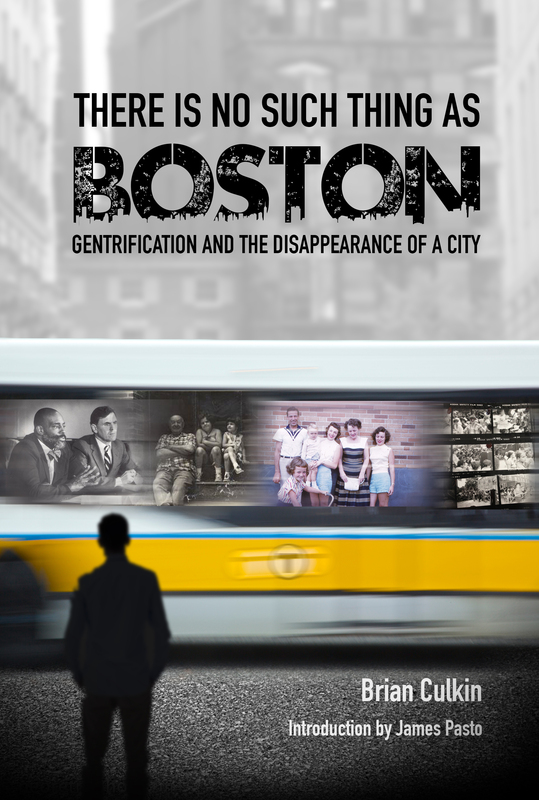 ´There is no such as Boston´ is now available for purchase.